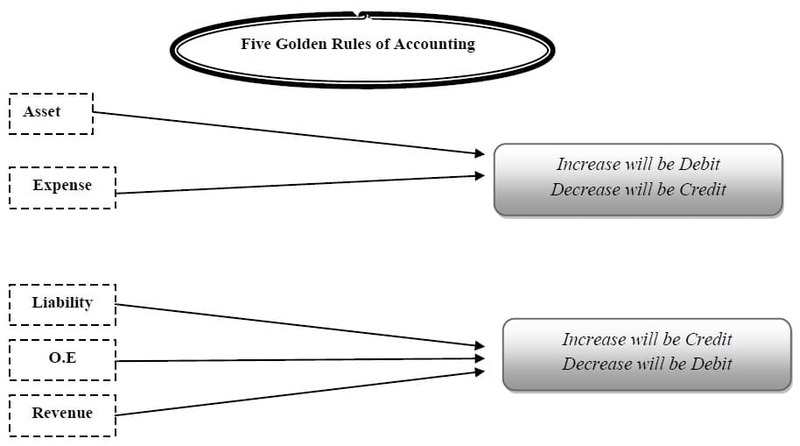 Golden Rules of Accounting are used to record economic activity in books of accounts. These rules are formulated on the basis of three basic accounts, personal, real and nominal account. An account is a summarized record of the transactions relating to one person or thing or one class of income and expense. Natural Personal Account is an account associated to human like Amna Tabbasum, Usman Khurshid, etc. Artificial personal account is account related to any artificial person like XYZ Ltd, Ramin Trading, Asadullah Industries, etc. on the other hand, representative personal account represents a group of account. If there are a number of accounts of similar nature, it is better to group them like, rent payable account, salary payable account, and insurance prepaid account, etc. In case of personal account debit the account of the receiver and credit the account of the giver. Tangible assets are touchable assets having physical substance, such as machinery, stock, plant, furniture, cash, etc., and intangible assets are non-touchable assets such as patent, goodwill, copyrights, etc. In case of real account debit the account of assets that comes in the business and credit the account of that which goes out the business. Since this account does not represent any personal or real account, it is called nominal or fictitious account. They relate to income, expense and gains or losses of a business concern. For example, salaries account, advertising account, discount account, sales account, and commission received account etc. These accounts do not have any existence, form or shape. All kinds of expense account, loss account, gain account or income accounts come under the category of nominal account. All the business transactions are recorded on the basis of the following golden rules of accounting. The receiving aspect in a transaction is known as? Capital account is classified under which of the following account? Nominal Account is classified under which of the following account? Goodwill is an example of the following account? 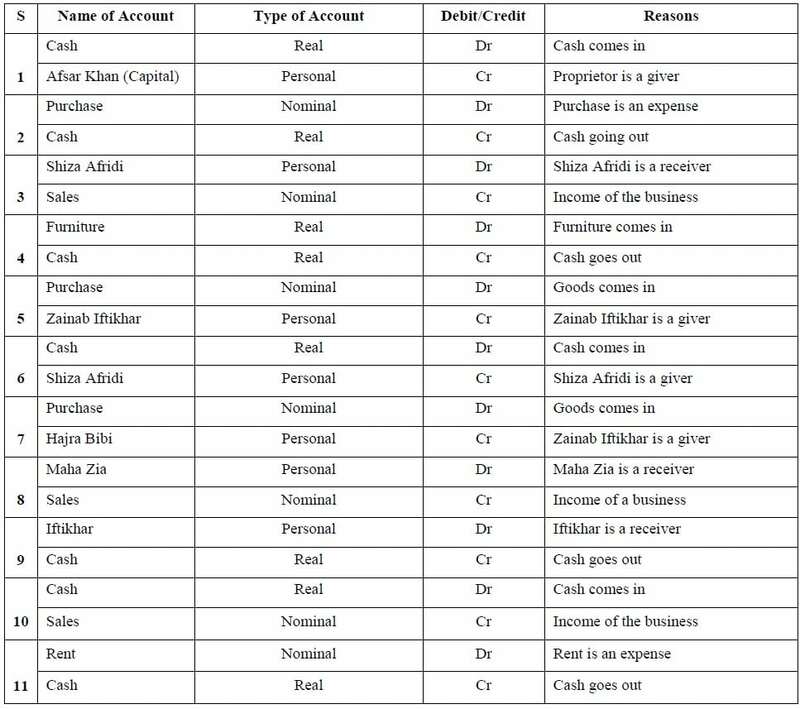 Account Payable is an example for which of the following account? Classify the following items into Personal, Real and Nominal Accounts. Siam Afsar Khan started business with cash Rs. 250,000. Purchase goods for cash Rs. 15,000. Sold good to Shiza Afridi Rs. 5,000. Purchase furniture for cash Rs. 30,000. Bought goods from Zainab Iftikhar Rs. 45,000. Received from Shiza Afridi on account Rs. 3,000. Goods bought from Hajra Bibi Rs. 10,000. Sold goods to Maha Zia Rs. 8,000. Paid to Zainab Iftikhar Rs. 25,000. Sold goods for cash Rs. 12,000. Paid rent of shop Rs. 17,000. Accounting rules are also classified as “5 Golden Rules of Accounting”, which include asset, liability, owner’s equity, revenue and expense. Current assets are assets (future economic value) of the business that will be consumed, or used converted into cash within the next 12 months. For instance, cash in hand, cash at bank, stock, accounts receivable, prepaid, etc. On the other hand, non-current assets are assets of the business expects will still be in use after a year, and not used or converted into cash with in 12 month. Examples of non-current assets are buildings, land, machinery, vehicles, office equipment, investments, etc. Current liabilities are obligations that the business is required to satisfy within the next 12 months. Such as accounts payable, payable and outstanding etc. Non-current liabilities are obligations that the business is required to satisfy or pay after or beyond 12 months, for instance, mortgages, bank loan (more than a year), mortgage loan, etc. Owner’s equity is what the business is worth. It is what the owners have put into or invested in the business; another words, we can say that it is an internal liability of business organization, as it shows what the business owes to the owner. The words ‘proprietorship’ or ‘equity’ or ‘capital’ means the same as ‘owners’ equity’. Examples of owners’ equity are capital, drawings. Revenue is the earnings, proceeds or takings from the operations of a business. The word ‘income’ means the same as ‘revenue’. For example, commission received, sales, fees, interest received, and rent received etc. Expense is what is incurred or spent in making the sales, and in running the business. For our purposes, ‘cost’ means the same as ‘expense’. Examples of expense are cost of goods sold, wages or salaries, rent expense, postage expense, and stationery expense etc. Thank you so much for this rule. its very helpful for everyone. Thank you so much for you because your explanation is very useful to me. Sir, Which transaction are recorded in debit side in journal, but these transaction are changed in credit side in ledger. Why it is change?